Rumor: Is "Resident Evil 6" Confirmed For Tokyo Game Show? 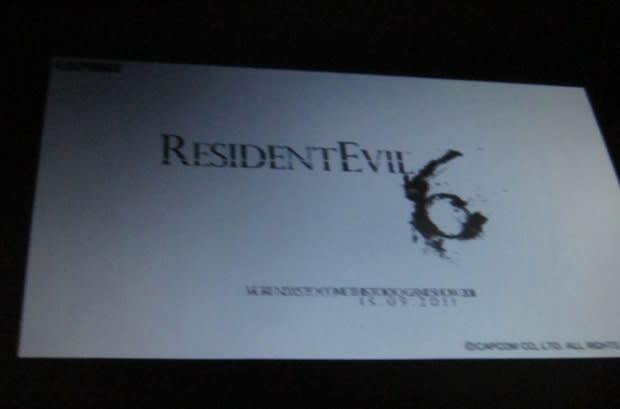 No, your eyes aren&apos;t deceiving you, that is an image of what is believed to be the official logo for Resident Evil 6. The pic was sent from a behind closed doors Capcom press event during last week&apos;s San Diego Comic-Con. If you look very closely, you&apos;ll see the date "15-09-11" stamped underneath the game&apos;s title. Coincidentally enough, that happens to be the start date for this year&apos;s Tokyo Game Show. Masachika Kawata recently stated that a complete renovation of Resident Evil 6 has been promised. Other than that Capcom isn&apos;t saying anything, leaving us to pull info from out the sky, all we have is this very realistic-looking logo to tide us over. If you have a jones in your bones to play anything zombie-related, you&apos;ll be able to replay the brilliant Resident Evil 4 in HD this autumn on Xbox 360 and PS3.